Harry enlisted in the U.S. Army in January 1941 as radio instructor private first class in 186 Field Artillery Battalion. He was commissioned directly as a second lieutenant in the Electronics Training Group (ETG) Signal Corps from Fort Ethan Allen, Vermont, to Fort Monmouth, New Jersey. Four days after Pearl Harbor, Harry was sent to England for three months training in the British Radar School in Petersham, Surrey. Harry was posted to Cardiff, Wales to install 12 150 mm Searchlights with SLC radar. He returned to the United States on the Queen Mary on Oct. 14, 1942, and married Miss Crane of Burlington, Vermont on Oct. 23, 1942. He served until the end of World War II at Wright Patterson Air Force Base in Dayton, Ohio, as officer in charge of ground radar supply for the entire AAF. Harry served a total of 41 years ending as a colonel and commandant of the 2086th Army Reserve Service Unit, Norfolk, USAR School. 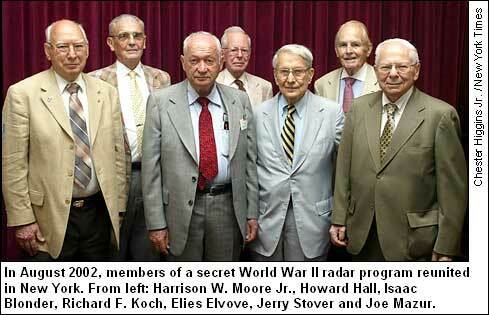 On Aug. 7, 2002, Harry conducted a reunion of a few of the 900-plus radar officers of his WWII U.S. Army Signal Corps ETG who served in England with him, along with others in the British Army and Royal Air Force. Jerry Stover was among RCA members who attended. Isaac Blonder maintains a web page that includes a New York Times newspaper story about the reunion. Harry graduated and taught at the General Staff College and the Industrial College of the Armed Forces. He attended Haverford College and completed a B.A. degree from Columbia in New York City in October 1946. His civilian career included positions as a sales manager for Fisher Radio in New York City, working for WBSM in New Bedford, Massachusetts and WTAR AM and FM, Norfolk, Virginia, and he was the owner-manager of WRVC FM, Tidewaters classical music station in Norfolk. While residing in Norfolk, he supported his wife in her role as a personality on at least two local television shows, including Miss Betty of Romper Room. He became the community affairs director with the Norfolk Chamber of Commerce and in 1967 moved to Sleepy Hollow, New York to become a staff executive with the U.S. Chamber of Commerce where he served for 15 years. Harry retired in 1983, and with his wife Betty started the New York Institute for Management Studies, holding executive development seminars. Harry retired again 15 years later, after Betty died in August of 1995. Three years later, Harry married Martha Rhodes Bennett (formerly Mrs. Ivan Bennett) of Bronxville, New York. Harry was always active, even during his retirements, with many friends and associates in organizations such as the Hudson Valley Chapter 181 of the Quarter Century Wireless Association (a communications group where he served two terms as president and was active for more than 20 years) and the Old Old Timers Club (a national group for ham radio operators who have been licensed for more than 40 years where he served as vice president). He was an active member of the Reserve Officers Association (serving as president of the Westchester chapter), a life member of the American Radio Relay League, a member of the Radio Club of America, and Antique Wireless Association, among others. He continued active membership in the Unitarian Church, the Association of the U.S. Army and the Westchester Emergency Communications Association. He started the local chapter of the World Future Society. He was also active in the Bronxville Rotary Club and served on the Board of the United Nations Association. Harry is survived by his son Chris Moore and wife Mary Sue; and grandchildren Sally Elizabeth Moore and Daniel Harrison Moore. A sister, Ethel Mary Moore, predeceased him. Other surviving relatives include Susan and husband John Anderson, Paul Bennett and wife Nancy Rankin, Katherine and husband John Evans, Dr. Jeffrey Bennett, Katie Anderson, Christopher Anderson, Laura Bennett, Rachel Bennett, Amaretta Evans and Ivan Evans. A memorial service celebrating Harrys life will be held at the Community Unitarian Church of White Plains, NewYork, Sunday, Feb. 4 at 1:30 p.m. In lieu of flowers, friends may contribute to the White Plains Red Cross in memory of Harry Moore. To sign Harrys online guestbook visit www.westchesterfuneralhome.com. This entry was posted on Saturday, January 20th, 2007 at 12:01 am and is filed under Obituaries. You can follow any responses to this entry through the RSS 2.0 feed. You can leave a response, or trackback from your own site.